Reaction time (RT) is the elapsed time between the presentation of a sensory stimulus and the subsequent behavioral response. Imagine that you are driving on the high way, and suddenly, you see the brake light of the car in front of you just turned on. You will of course try to hit the brakes to slow down your car. But, there is a small time delay before you really do that and that is your reaction time. During that period of your reaction time, your car is still moving at the same HIGH speed! So, what is the minimum distance between the front of your car and the rear of the car before yours? Assume that both cars need the same distance to fully stopped, the minimum distance is the velocity of your car multiply by your reaction time. 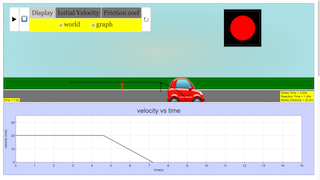 Click on the Play button to start the red car which will move with an initial velocity selectable from the slider bar. The traffic light will turn from green to yellow, then to red at a randomly generated time interval. Click on the brake button when you see the red light turned on. The green, yellow and red arrows indicate the car's position when the green, yellow and red light started turned on. The black and blue arrows indicate the car's position when you hit the brake and the position when the car is fully stopped. The distance between the RED and BLACK arrows is the minimum distance to keep. The light then changes to yellow. It is an indicator for the user to get ready to press the stop (square) button beside the play button. When the traffic light turns red, the stop button will be enable. Watch as the car halts all movements. Read your reaction time from the graph below. Double tap anywhere on the screen to toggle full screen.